This set of bells was sent by a wonderful gal from Illinois. A bell strap with shank bells like these is usually lined for use on a horse, but this client asked us to put the bells on an unlined strap. She just wanted to display the bells in her home and felt the lining was an unnecessary expense. Her petal bells and their original strap date from the late 1800s. Many of the bells have a delicate "dash" mark in the center of each petal. We see this detail mainly on bells we receive from customers in the Midwest, especially the upper Midwest. Because the regional association is so strong, I assume there was a bell maker in Michigan, Wisconsin, Minnesota, Illinois, Missouri, Iowa, or nearby state who specialized in this version of the classic petal bell design. 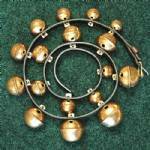 The bells range in size from 1 3/8" (#3) to 2 3/8" (#11). We added a pair of our 2 1/4" (#10) bells to the client's bells, so the bells would increase evenly in size along the strap: #3-#4-#5-#6-#7-#8-#9-#10-#11 and back down to a #3 bell. While this strap does not have the most or largest bells on it, compared with others we have restored, it has a lovely, full sound. The new strap is 1 inch wide and about 4 1/2 feet long. The billet (tongue) end is tapered to accommodate a new 7/8" buckle. The use of a buckle that is slightly narrower than the main strap is a graceful detail we see on many older bell straps. The buckle is hand stitched in place with flax (linen) thread and a traditional 2-needle saddler's stitch.